For the last few days water in my area of Lancashire has been contaminated, and has had to be boiled for drinking and food prep. I really can’t complain, as in the grand scheme of things I’ve got it easy, hospitals and care homes have had a very difficult time of it. And of course the hotels and cafe’s of nearby Blackpool are at their busiest time of year! But today I need to cook. So with the theory that baked polenta won’t be such a pain to wash up as if I’d cooked it in a pan (wet polenta is almost akin to porridge in its ability to glue itself to saucepans I think! ), I thought I’d give this method a try. I’ve added smashed butterbeans for a bit of protein, and because I love them! As the oven was on for the polenta I thought I’d bake the vegetables too, to make a thick, spicy, flavoursome sauce. I’ve been wary of baked sauces since years ago (when I still believed timings in food magazines…), I made an all in one oven baked ratatouille. It took three times as long as it should have to cook, and was still pretty awful! So here I’ve staggered the cooking time for the vegetables so that they all cook through and the flavours meld. It does take a while, but hey, while things are in in the oven you can get on with other stuff! Preheat the oven to 200 degrees c. Very lightly grease a small baking dish, about 20 x 10 cm. Put the butterbeans in the baking dish and mash them a bit with a fork. Add the polenta, nutritional yeast, stock powder, water, soy milk and some salt and pepper. Mix together thoroughly. For the vegetables, drizzle half a teaspoon of oil in a roasting tin (I’m using a spray bottle which makes it easier to spread evenly). Add the onions, carrots, yellow pepper and fennel seeds. Drizzle or spray the other half teaspoon of oil on top. Put the vegetables and polenta in the oven for 20 minutes. Mix the garlic through the veg and pop back in the oven for 5 minutes. The vegetables should be starting to brown at the edges now, and the polenta will be set. Remove the polenta from the oven and leave to cool a bit. Add the courgettes, oregano and chilli to the vegetables and mix well. Tip in the plum tomatoes and juice, leaving the tomatoes whole. Season with salt and pepper. Mix a little, but you don’t want the vegetables to be coated in tomato juice, the bits that aren’t should caramelise beautifully and the bits that are will soften and become juicy. Bake for a further 35 minutes. By this point the tomato juice should have evaporated and thickened and the vegetables should be soft. 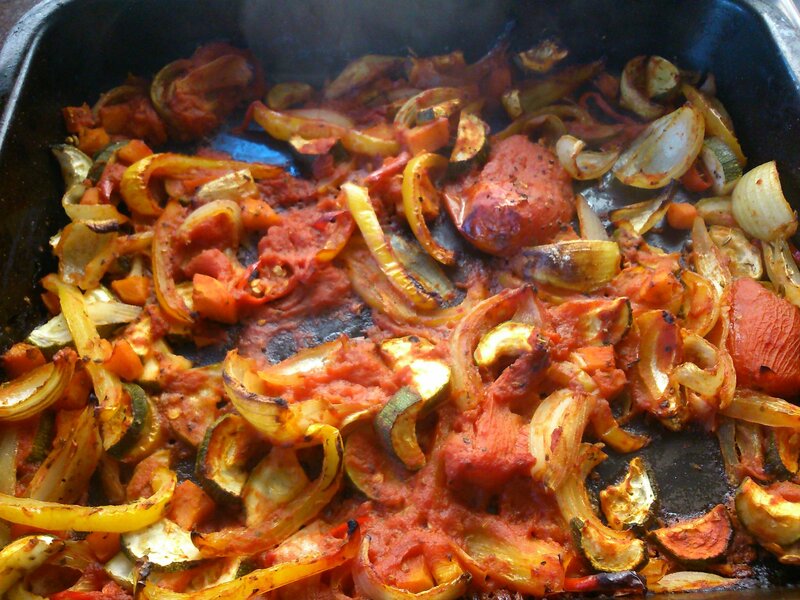 Spicy vegetable oven sauce, yum! Turn the polenta out of the dish and cut into wedges. 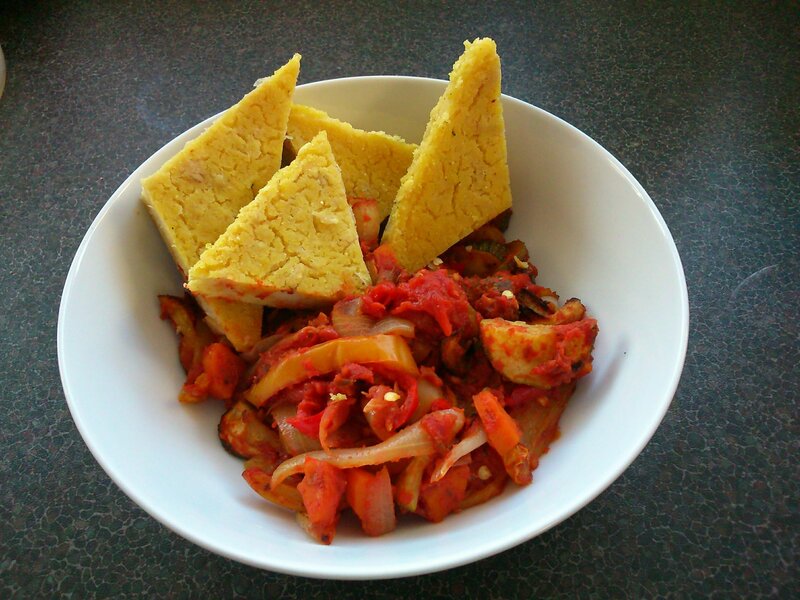 Serve a bowl of the spicy vegetables with polenta wedges for scooping. Ooo, this looks like a really hearty dish. Yum! oh wow! as usual everything looks so delicious 🙂 wish I could reach in and eat it right now!